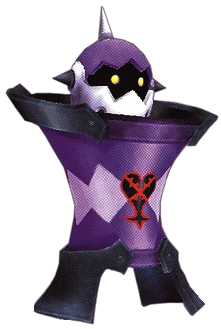 The Opposite Armor is an Emblem Heartless that is found in Kingdom Hearts and Kingdom Hearts Final Mix. It is one of the bosses at Traverse Town. The various pieces of the Opposite Armor, known as "Armored Torso", "Gauntlets", and "Hammerlegs", are able to move independently. After sealing the Keyhole in Deep Jungle, Sora returns to Traverse Town and tests the legend about the Second District bell by ringing it three times, revealing the world's Keyhole within the district's fountain. However, as the group goes to seal it they are attacked by a Guard Armor, and though they defeat it, it transforms itself into the stronger Opposite Armor and attacks again. After it is destroyed, they are able to seal Traverse Town's Keyhole. A second Opposite Armor appears in the Hades Cup. The Opposite Armor's body is made of identical components to the Guard Armor, the key difference between the two being that the Opposite Armor's are inverted. Thus, its torso is upside down, with the collar-like additive now being on its underside. The Heartless emblem is emblazoned on the center of the armor. Its head is the only part of its body that is not actually inverted, but instead its faceplate drops down. This exposes that the Heartless does in fact share the pitch-black face and glowing yellow eyes of other Heartless. 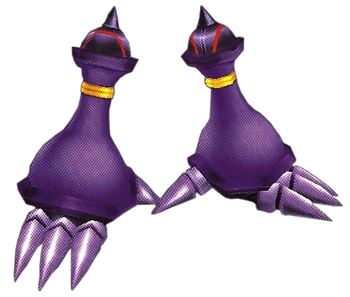 Both of the Gauntlets now act as the Opposite Armor's legs, and it walks on its hands. The Hammerlegs take the places of its arms, and its feet replace its armored hands, seemingly converting into pincers. Curiously, the Opposite Armor's Heartless emblem is right side-up, despite it being the Guard Armor's torso flipped upside-down. However, viewing its model in Jiminy's Journal reveals it to have two heartless emblems, one on the front, and an up-side-down one on its back. 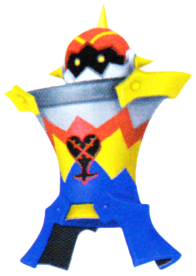 In Kingdom Hearts Final Mix, the violet sections of the Opposite Armor are silver, its torso gains red, yellow, and blue stripes on its upper half, its head becomes red with yellow spikes, and the additives on its top and upper rims become blue and yellow, respectively. Its fingers become grey, while its feet become red. The Opposite Armor's name references its armored body, as well as the fact that its body parts are the inverted pieces of the Guard Armor's body. The Opposite Armor throws all four limbs at once at Sora. The Opposite Armor performs a back flip, attacking with the Gauntlets. Hammerleg-Head: The Head vertically revolves around the Hammerlegs, attacking with its spike while charging forward. 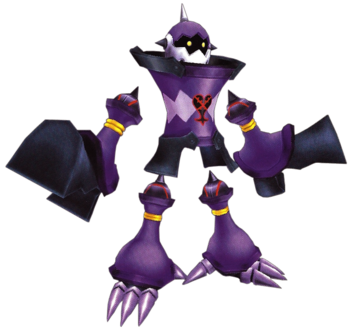 Gauntlet-Torso: The Gauntlets spin in front of the Armored Torso while homing in on Sora. The Opposite Armor rearranges its body to give it the appearance of a cannon and shoots energy blasts from the torso. This Heartless is an inverted but stronger version of the Guard Armor. Like its predecessor, each part attacks individually or in concert. It also has more mobility due to the fact that it can levitate. 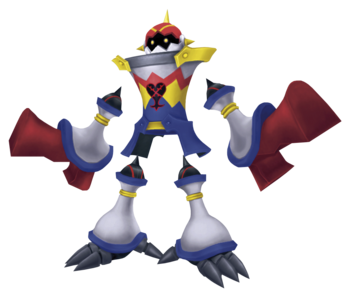 It also has a powerful desperation move where it rearranges its body to give it the appearance of a cannon and shoot energy blasts from the torso. The first part of this battle is reminiscent of the first boss battle in Traverse Town with Guard Armor. However, once its health bar reaches a certain point, the body parts will completely collapse and rearrange themselves to form an even nastier opponent. Note that Sora can enter and exit freely from the Second District during this battle, but if he has defeated some of its body parts and then leaves, Opposite Armor will have full HP and all its body parts with it when Sora reenters the area. Opposite Armor uses similar spinning tricks as Guard Armor. Most of these attacks can be deflected with Guard, creating an opening for an attack. 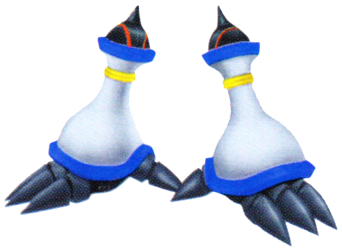 During the battle, it will split into two separate formations that attack independently. Focus on the Gauntlet-Torso formation, as it has a homing attack, while keeping an eye open for the Hammerleg-Head formation. Also, remember that the Opposite Armor is an airborne enemy, unlike the Guard Armor. Begin by taking out the Gauntlets, as it will reduce the amount of stress considerably, followed by the Hammerlegs. Once all that remains is the torso, it will frequently execute a bazooka-esque attack. Avoid this using Dodge Roll, or block with a well timed Guard, and quickly perform an aerial combo. The torso will then attempt to escape, so make sure to follow it, or avoiding the attack will be difficult. After defeating the Opposite Armor, Sora receives a new spell, Aero, and another Navi-G Piece. ↑ 1.0 1.1 1.2 1.3 The HP of each limb is separate.